This month’s Ecology Letters features the first global quantitative synthesis of under-ice lake ecology. In their analysis of 36 abiotic and biotic variables across 101 lakes, the authors issue a call to arms for more winter lake research—currently the focus of only 2% of freshwater publications. As the climate warms, they warn, temperate ecosystems are losing ice, and limnologists remain unsure what ecological processes are at stake. Though winter has long been understood as an inactive period, some data suggests that winter foodwebs and physical processes remain vigorous and that winter ecology can drive subsequent summer conditions. The synthesis results confirm these observations: while primary producers and consumers are less abundant under ice, they maintain substantial populations, which along with relatively high chlorophyll a values, suggests high productivity in winter waters. In addition, the scientists found frequent correlations between values from winter and the previous/subsequent summer. For both plankton and chlorophyll, a summer peak often preceded a winter low, and vice-versa. 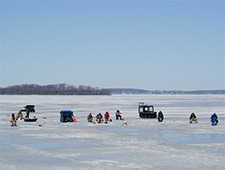 The authors urge the limnological field to explore the drivers of these relationships, in order to better understand how changes in winter weather will alter year-round lake dynamics.